Effect Gives Mario the dodgy status. 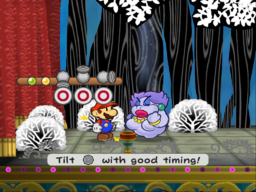 Dodgy Fog is an attack that Flurrie used during the events of Paper Mario: The Thousand-Year Door. This attack is only accessible by leveling Flurrie to the Ultra Rank. When the move is used, Flurrie turns toward Mario and gives him the Dodgy status for a limited number of turns. This attack uses four FP. The player has to tilt the in the right direction as shown to use this attack. With each correct tilt increasing the number of turns by one. The Stylish Move of this move is performed by pressing right after the fog appears, and Flurrie points her little finger up if it is performed correctly. This move is similar to Lakilester's move Cloud Nine. Yokeyoke Sumouku Yokeyoke Smoke. Yoke means protection. This page was last edited on February 18, 2018, at 19:19.